Our roadmap is defined on Virto Commerce GitHub page GitHub page. You can submit your suggestions or discuss specific features there. Below are just some highlights of what has been done and what is planned. Migration to .NET Core Framework Migrate core storefront and platform to the latest .NET Core Framework. Webhooks Implementation for Orders module Create Web Hooks API to allow for easier integration with external systems. Migration to TypeScript/Angular7 We will be migrating all backend modules to the latest TypeScript framework. Drastic Performance Improvements Order creation, catalog browsing, cart management, indexed search and some other functions will work even faster. Full Context Searching in a Storefront Use a generic search engine to search a storefront for both products and text. Property Management Improvements Property role-based access, property render type management, properties grouping. CMS Landing Page Builder GUI Editor to allow marketing team to quickly build landing pages. Generic Data Export and Import Export and import data ranges related to any module by using files in csv, json or other formats. Product Data Versioning Persist multiple versions of the product data and allow reverting to previous version if needed. Order Approval Workflow This functionality has been used by many of our existing clients and we will now include it as part of the default feature in Virto Commerce. Bulk Product Editing Bulk updates to product data in the UI. Direct Links to Entities Direct URLs for key entities: products, categories, contacts, orders. These are just some features implemented in the past, more details available here. Advanced recommendation engine Provide product recommendations based on customer behaviour. Azure Search Support Provide Microsoft Azure Search provider. Recurring billing/subscription module Add support for recurring billing and subscription management. Google Commerce Analytics Out of the box integration with Google Analytics Commerce API, track cart abandonments, product views and total sales by products all in real time. Platform modules Auto Updates (June 2016) Support for platform modules auto updates. Asset manager Single explorer like interface to manage all your digital assets no matter where they are located, in the cloud storage or locally. B2B/B2C Quotation Quotation system enables business users to execute quote requests online with custom pricing without a need to create special coupons. Document based order system This model has a new architecture that provides transaction model and support for simplifying various B2B and B2C scenarios. Integration with ERP and WMS platforms will be much more intuitive and simple. 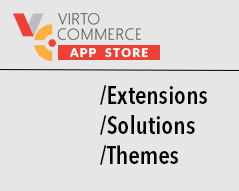 Virto Commerce AppStore Site where our partners can publish various components and solutions for Virto Commerce. It will allow for a better collaboration between partners, solution providers and customers. Our core modules will also be published through new appstore site. Personalized B2B product catalog Out of the box module that allows creating business rules to customer B2B user experiences based on contract and terms. Bulk Order Support Allow B2B ordering of items in bulk using simple form. Redesigned frontend Implements AngularJS, full page caching for ultimate performance, product comparison, dependency injection, SDK client libraries. Shopify import Import your shopify store including custom themes. Orchard CMS integration Widgets for a popular ASP.NET CMS application. Mobile App (iOS, Android, Windows) Mobile Starter App for iOS, Android and Windows Mobile implemented using Ionic Framework. Admin localization Localized all strings in our angularjs based admin using json resource files. Added support for RTL languages (v2.10). Points & gift card support Added support for custom currencies including points and bitcoin. Support gift cards.